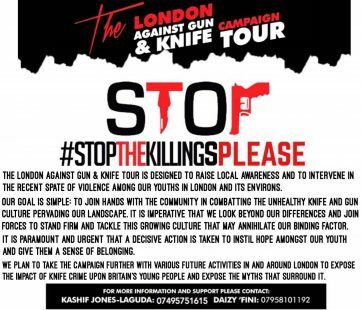 The LONDON AGAINST GUN & KNIFE TOUR is designed to raise local awareness and to intervene in the recent spate of violence among our youths in London and its environs. Why have we launched this campaign? Our goal is simple: to join hands with the community in combatting the unhealthy KNIFE and GUN culture pervading our landscape. It is imperative that we look beyond our differences and join forces to stand firm and tackle this growing culture that may annihilate our binding factor. It is paramount and urgent that a decisive action is taken to instil hope amongst our youth and give them a sense of belonging. The responsibility is on us to act quickly and address the root cause of this disturbance amongst our children. No one should have to go through the trauma of grief that could all together be averted in the first place. There is no publicly available national data on the number of children and teenagers killed by knives in London. We should be celebrating lives and not counting the number of lives violently cut short. London Against Gun & Knife aims to mark the death of every child or teenager killed by a knife and gun by finding out as much as we can about the factors that contribute to the problem of youth violence and explore the issues around their deaths. We plan to take the campaign tour in and around London to expose the impact of knife crime upon Britain’s young people and expose the myths that surround it. We call upon all parents and young people from ages 16 and above to join us to take this campaign in and around the city of London to tackle the epidemic of gun and knife crime amongst our young people.